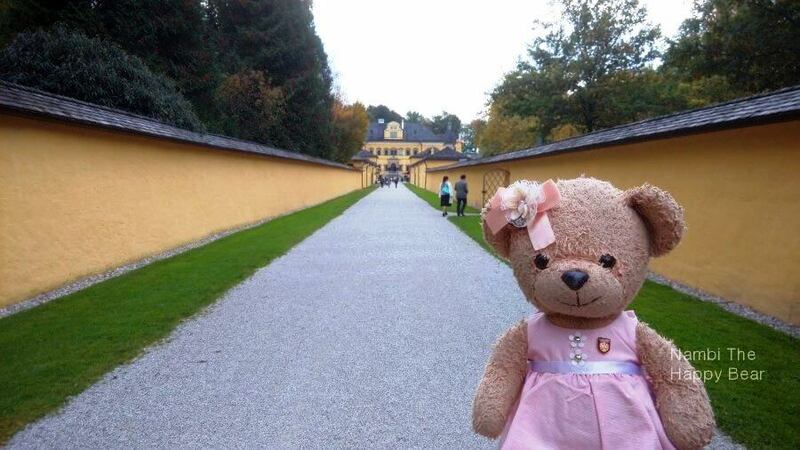 Today, I’m going to show you some of the cool places in Salzburg. Located near the Austria-Germany border at the edge of the Alps, Salzburg is the fourth-largest city in Austria. The Salzach River runs through the middle of the city, segregating the Old Town from the New Town. 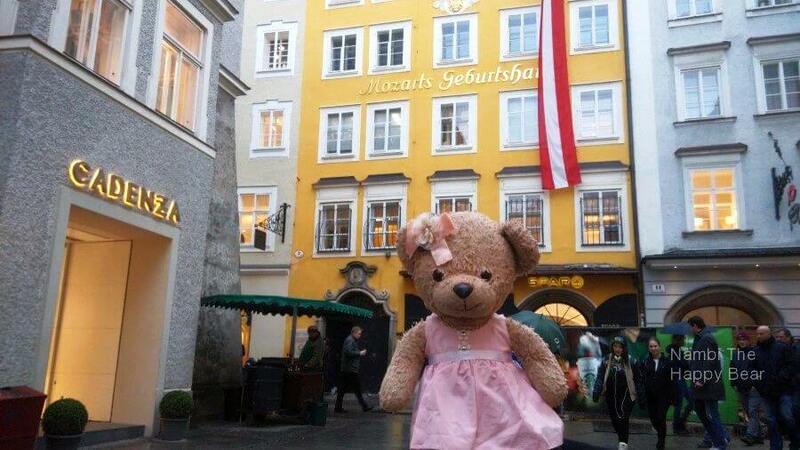 If you ever find yourself at the old town of Salzburg, you are going to find Mozart almost everywhere. He is undoubtedly the most famous son of this town. 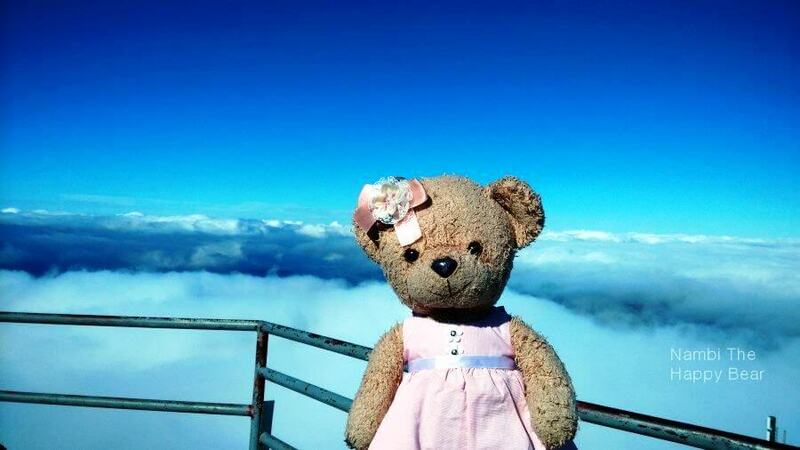 On top of that, thousands of tourists from all over the world flock to Salzburg for The Sound of Music pilgrimage. Shot in year 1965, this musical classic was largely filmed within Salzburg, and the movie still remains as one of the top grossing musicals of all-time. So many tourist attractions to choose from, and with so little time on hand, we’ll share our pick of the best things to do in Salzburg. This legendary musical genius needs no further introduction. One of the most prolific and influential musicians of his time, Wolfgang Amadeus Mozart was the composer of The Magic Flute, Don Giovanni, The Marriage of Figaro and the Symphony No. 40 in G minor. Draped in the Austrian National Flag and painted in bright yellow, this famous house is situated at No. 9 Getreidegasse – a shopping street famous for its metal signs. Visitors could tour this museum to find out more about his lifelong history and musical work. On the first floor, you will get to see how the Mozart family travelled and lived. In the old days, getting from one place to another was time-consuming and painstakingly difficult. Apparently Mozart had travelled for about 11 years of his life! Here, we get to see the violin which belongs to Mozart, which he picked up before he started to learn the harpsichord. The exhibition also shows his life in Vienna where Mozart reached his peak creativity and talent, and produced some of his greatest pieces. You can find a souvenir shop on the second floor. If you look closely, the exhibits were carefully annotated with English and German so they we had no trouble understanding the story of Mozart. Besides, there is an app that you can download for free, with explanations in other languages. In the Mozarthaus, again you will follow Mozart’s thirty-five year old from a child prodigy to a world-famous master composer. We learned that Mozart was the youngest of seven children, and had a sister named Maria Anna. His 5 other siblings unfortunately did not survived infancy. Mozart’s father, Leopold Mozart was an established composer and teacher that played a crucial role in unearthing Mozart’s musical genius. Mozart was so gifted that at the age of 5, he began composing pieces and played them to his father. Then his family started to tour the Europe where he and his sister performed as inspiring child prodigies. As Mozart got older, his fame grew. At the age of 17, he became appointed as court musician by the ruler of Salzburg. He later moved to Vienna and married his wife Constanze Weber. The museum houses a trove of musical instruments, letters and memorabilia from his early years. 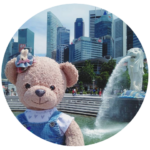 I visited the souvenir shops and took some photos at the postcard machine, I got myself a little Mozart bear too! He is so cool! Our family just loves buying souvenirs everywhere we visited hahaha. This is the perfect dating place for couples. 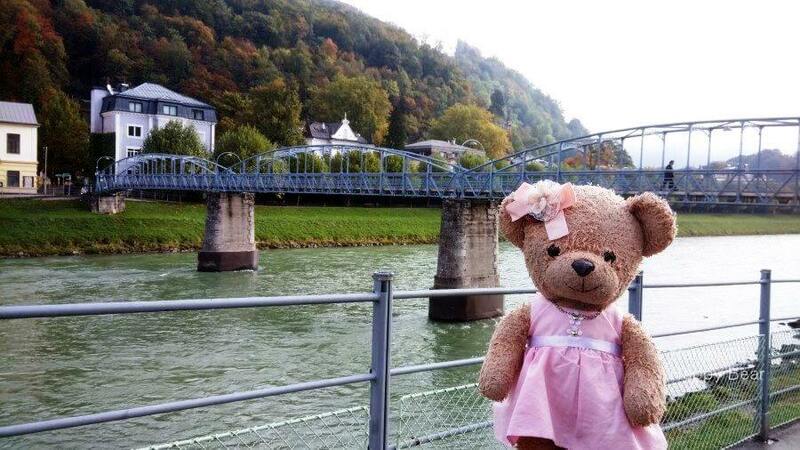 The Makartsteg bridge (I’m sorry, my Mama and Papa didn’t take a picture of the actual Makartsteg bridge so I will just show you a random bridge hehe), also known as the Love Locks Bridge of Salzburg, is a pedestrian bridge over the Salzach River. If you ever take a stroll along the river, you’ll recognise this bridge almost instantly because of the thousands of padlocks left behind by madly infatuated couples from all over the world. Most of the locks are red or pink in colour and you can buy them easily from the nearby marketplace although the price tag might be a bit steep. But hey, love is priceless right? A closer inspection of the locks will reveal the names of the lovers written on it, often accompanied by words like “love forever”. The locks also come in different shapes and sizes, and some even have names engraved on it. You are supposed to lock your padlock onto the bridge and then throw the keys into the river to symbolise eternal love. I can imagine that if one were to dive into the riverbed, one can find tons of padlock keys discarded into the river, just sitting there quietly for over a century, watching as the lovers declare their romance to the world by securing it to Makartsteg bridge with a padlock. 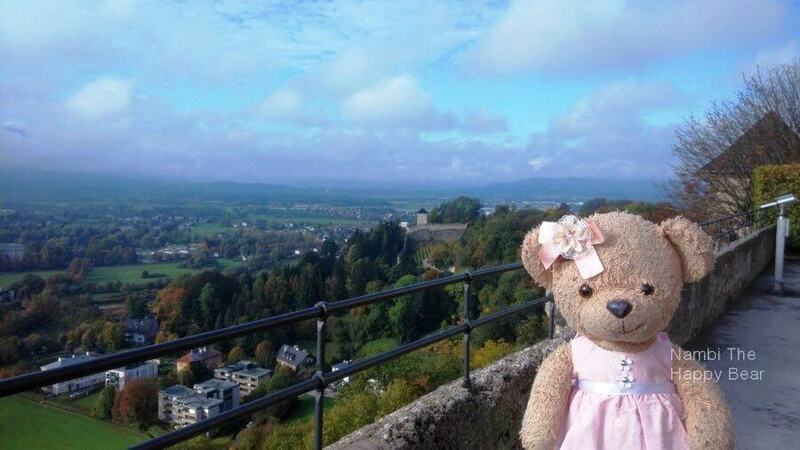 The bridge also offers a great view to the Hohensalzburg Fortress high up on the hill above this historic city. We took some touristy pictures over here before moving on to the next destination. 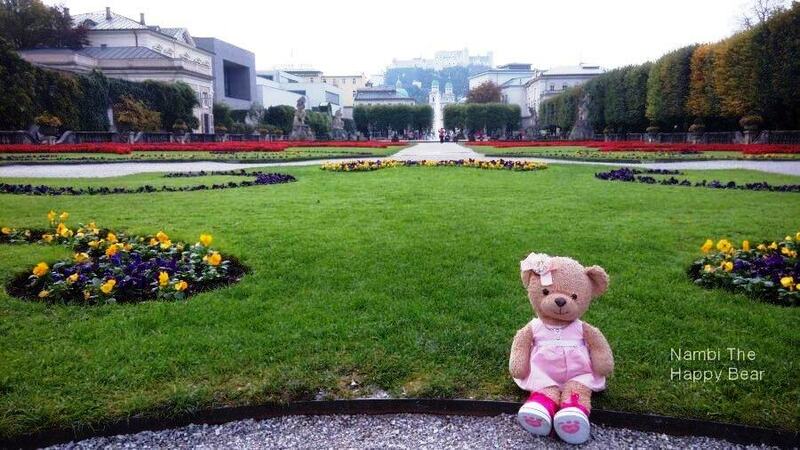 Fans of The Sound of Music will gleam when they see the Mirabell Gardens. 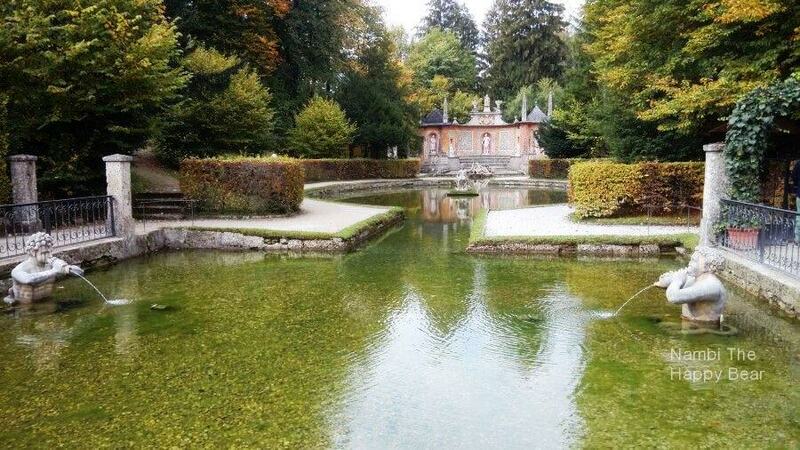 This meticulously manicured garden is the location where the cast sang and dance to Do-Re-Mi. 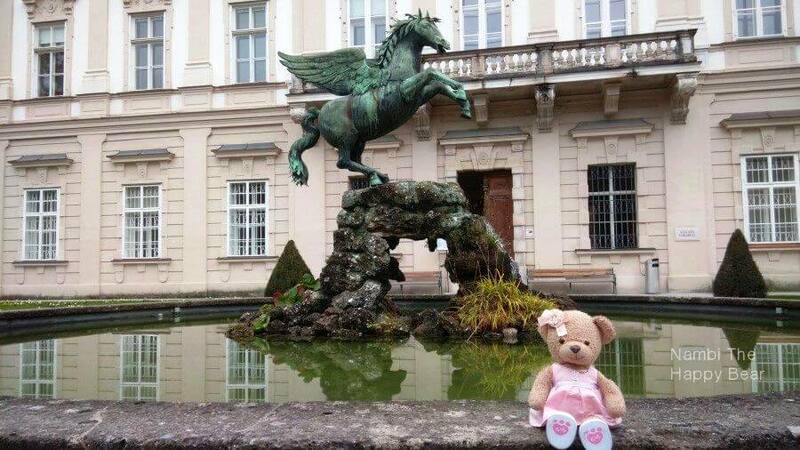 Try to spot the Pegasus Fountain, the stone gnomes or the garden steps from the movie. 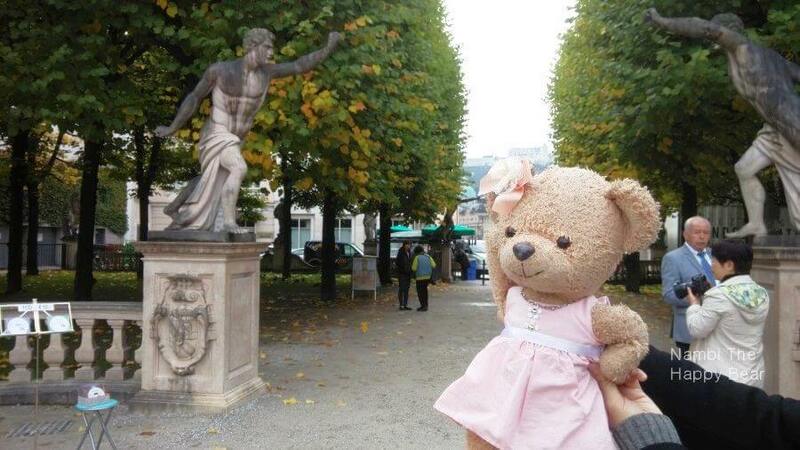 Throwing my fist in the air just like the Sound of Music in The Mirabell Gardens! 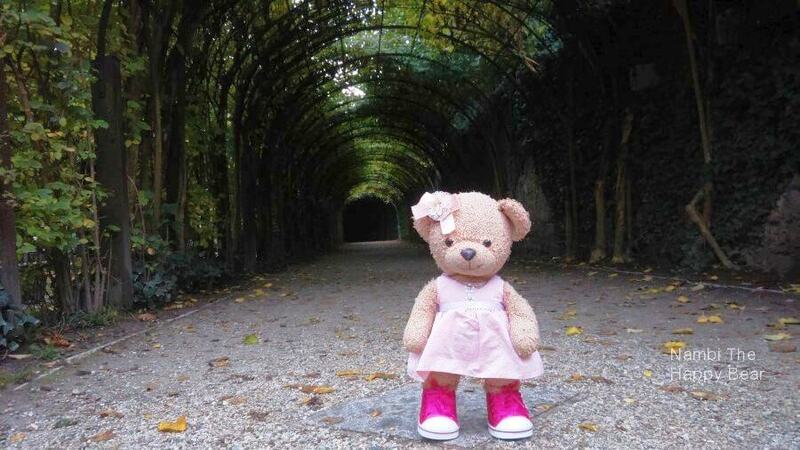 The tunnel of Mirabell Gardens…… a long long way to run with Maria and the kids! Besides that, the garden has a central fountain, an outdoor theatre and a great collection of sculptures. Marvel at the stunning perspective of Hohensalzburg Castle that seemed to loom over the town against the backdrop of the snowy Bavarian alps. 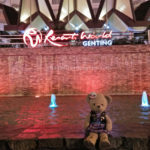 I danced here too! I was initially too shy at first but my papa encouraged me so hard to dance Do-Re-Mi, so I was like okay papa, I will just dance hahaha. The Mirabell Palace was built around 1606 under the orders of Prince-Archbishop Wolf Dietrich Raitenau, who decided to create a palace for him and his mistress Salome Alt. Modelled after French and Italian architecture, the palace was said to be built within just 6 months and named the Altenau Castle. So When Raitenau was overthrown by Mark Sittich von Hohenems, Mark gave the palace its current name based on the word “mirabile bella” meaning “amazing” or “wonderful”. It was later rebuilt from 1721 to 1727 in a extravagant Baroque style. 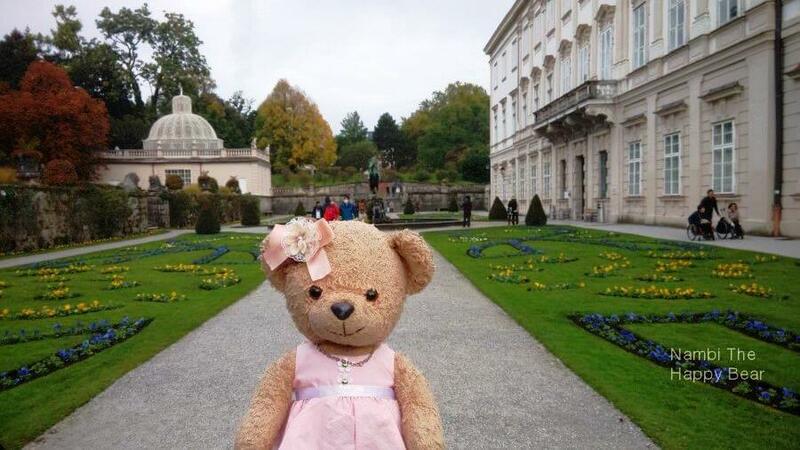 Yep, I’m standing on the steps used by Maria and the kids in the Sound of The Music! Don’t be jealous of me! 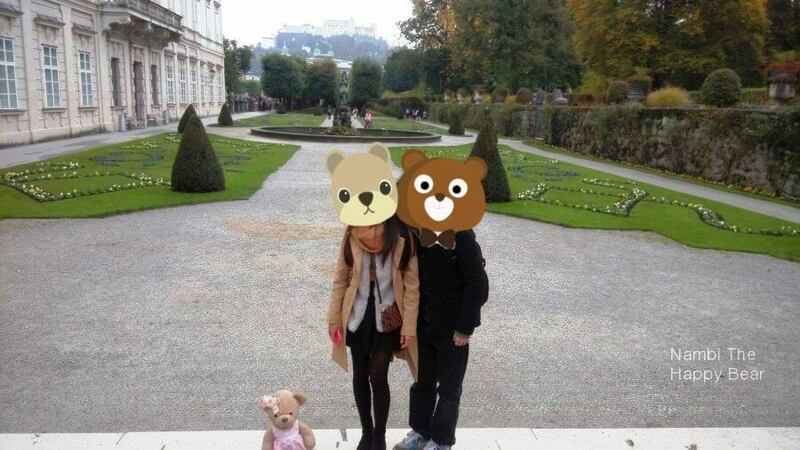 Family photo with my Papa and Mama at The Mirabell Palace & Gardens. Look at the gorgeous backdrop! If you have a keen eye, you could even spot a castle on top of the hill! 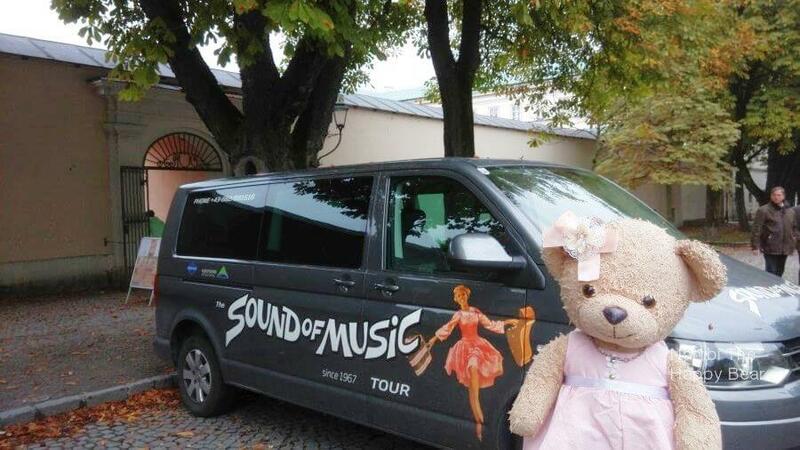 The people of Salzburg take great pride in their musical heritage. Remember what we said about Mozart being everywhere in this city? There is a plaza dedicated to the name of this celebrated musician and composer. 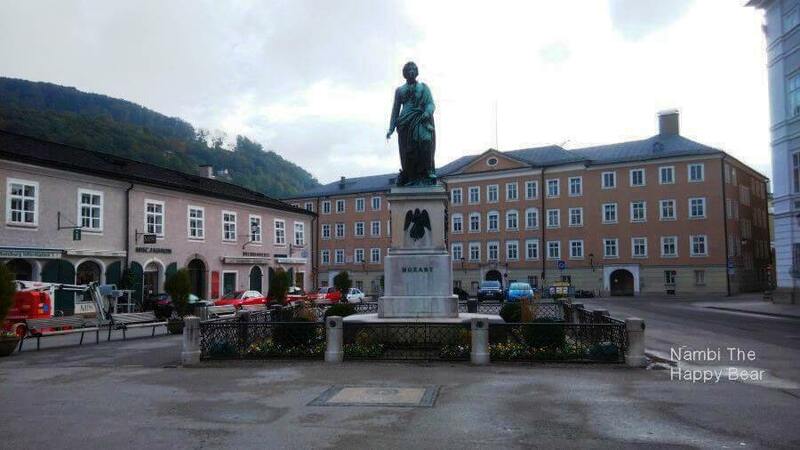 The Mozart Square is situated in front of the Salzburg museum. The Mozart statue standing there is of course, dedicated to Wolfgang Amadeus Mozart. This monument was designed by a German sculptor by the name of Ludwig Schwanthaler. 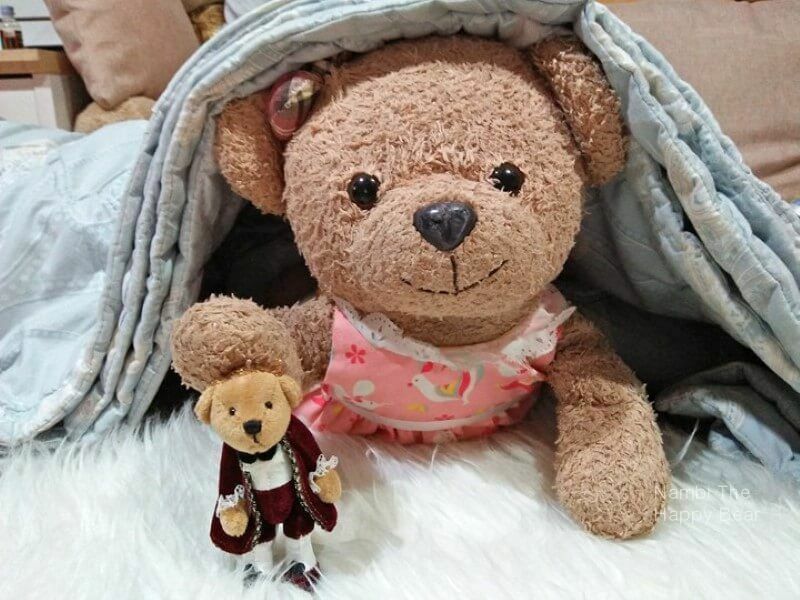 Much to our surprise, Bavaria’s King Ludwig I personally invested a substantial sum of money and sponsored the marble base for installation of the Mozart statue. Sad to say that Mozart never got to witness the monument, because it was only built in year 1842, more than 50 years after the death of the legendary composer. Those with a keen observation will be able to spot a plaque at No. 8 Mozartplatz which commemorates Mozart’s wife, Constanze Mozart-Nissen. She allegedly passed away just shortly before the unveiling ceremony of this monument on September 5, 1842, much to the grief of Mozart’s sons. On the far end of the square lies a tower with a carillon that can be traced back to the 17th century, still faithfully giving out three rings a day. 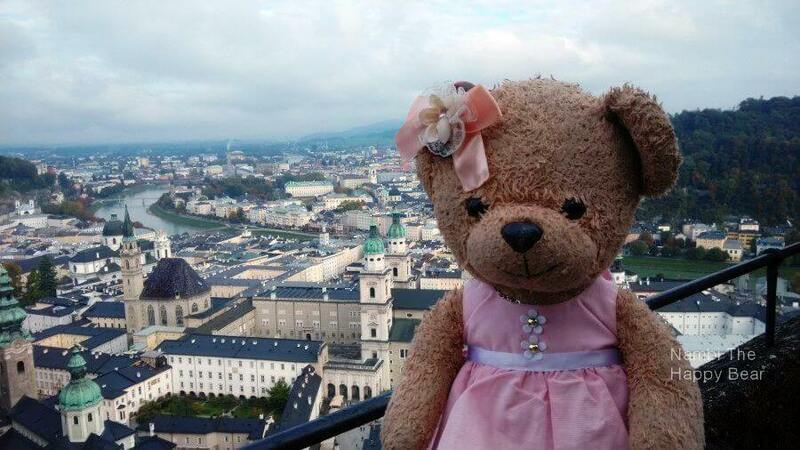 The carillon tower with the Mönchsberg in the background, is widely depicted in Salzburg’s photos and paintings. These days, the beautiful and stoic Mozart statue is one of the most popular tourist attractions in the historic district. If you have time, pay a visit to this nice little plaza and perhaps enjoy a cuppa. Perhaps you’ll reignite your love and passion for classical music. 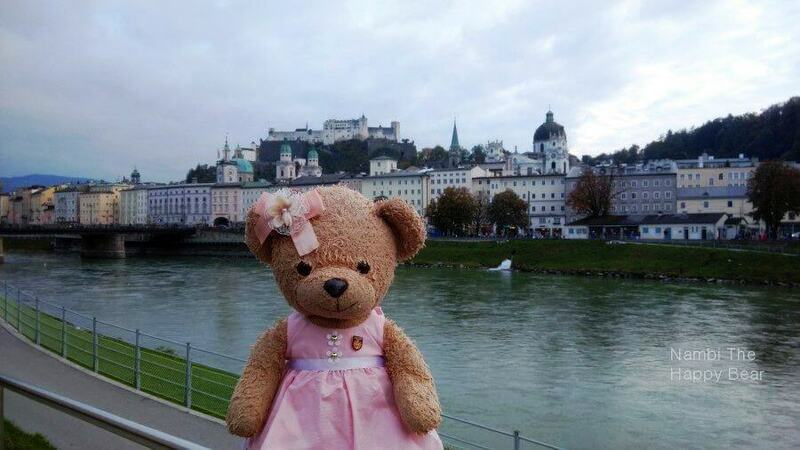 In Salzburg, you can find Mozart everywhere. 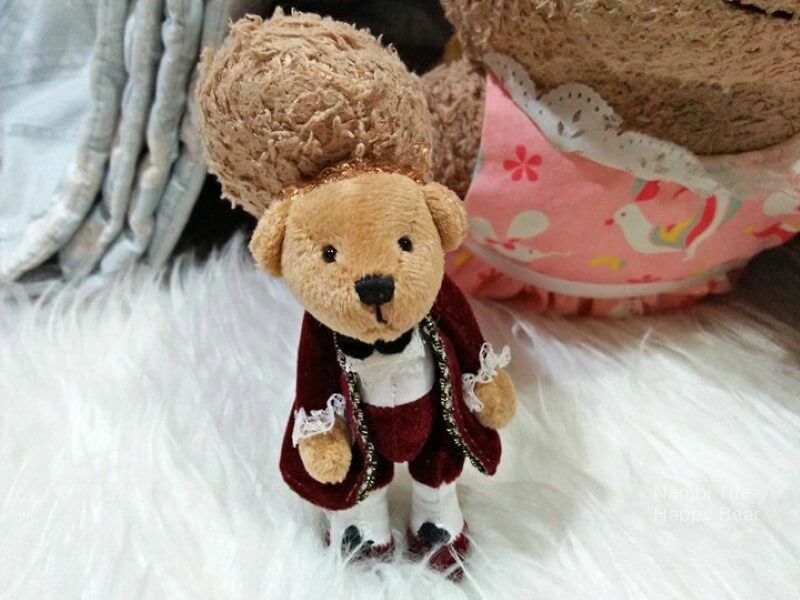 The most famous confection in Salzburg is none other than the Mozartkugel or Mozart Ball. This deliciously sweet praline is made of pistachio marzipan and nougat, which are then coated with rich, dark chocolate. Created in 1890 by the Salzburg confectioner Paul Fürst, it was first introduced to the market as Mozart-Bonbon. You can still taste the hand-made Original Salzburger Mozartkugein by the Fürst descendants today at Café Konditorei Fürst. Due to its popularity, numerous confectioners eventually came up with their own version of Mozartkugels and sent them into mass production. We paid a visit to the original Konditorei Fürst cafe in the Old Market. We were lucky to even secure a table as the place was packed with customers. 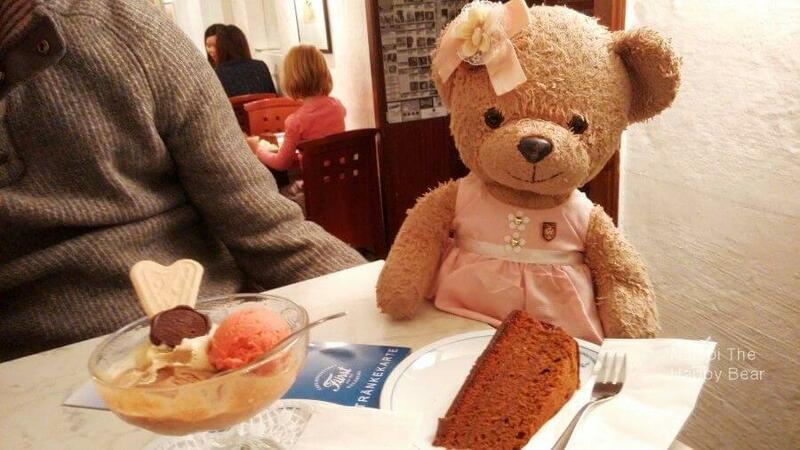 We had some ice cream and Mozartkugels at the cafe. The cafe’s ambience was simply amazing, and it seemed to be the focal point of the marketplace. There were an assortment of cakes and pastries in the cafe, but we have just eaten our lunch not long ago, so we did not get to try them. By the mouth-watering looks alone, I can already imagine that they must be so tasty! The Residenzplatz Square is located right next to the Mozart Square. 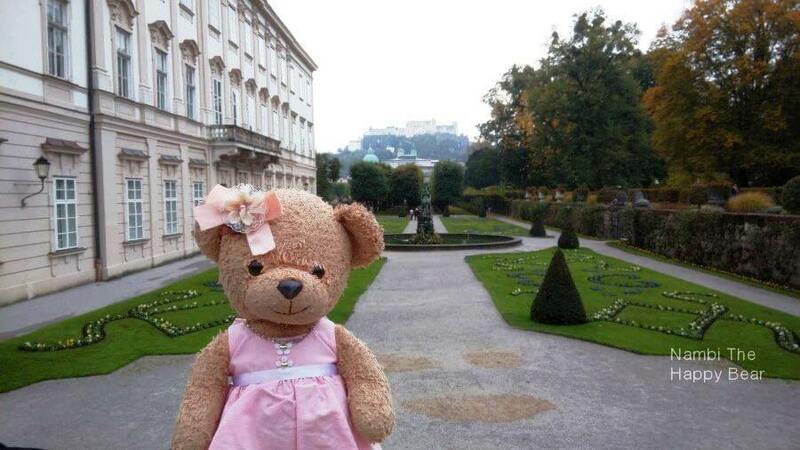 This is setting of another very memorable scene from the Sound of the Music. I remembered that as Maria made her way to the Von Trapp house, she sang the song of “I have confidence in me”. 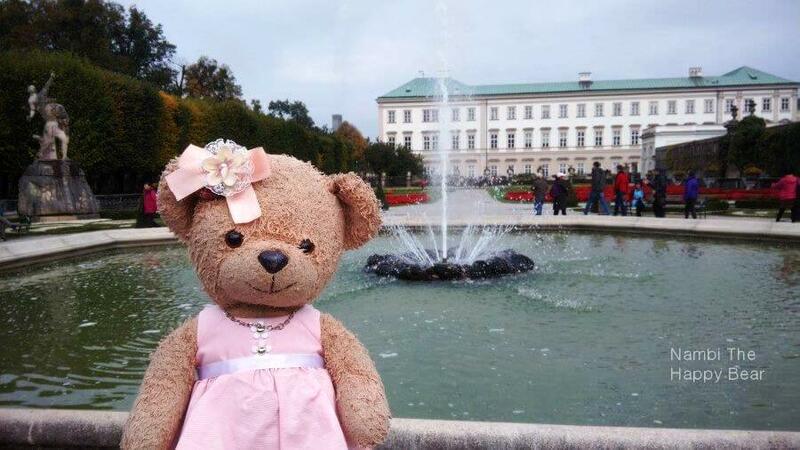 Then she stopped by the Residenzplatz Square briefly, and splashed the water in the Residenzbrunnen horse fountain! Playful girl! Anyway, this square was the biggest out of the five squares built under the reign of Prince-Archbishop Wolf Dietrich von Raitenau. 55 medieval buildings were demolished to accommodate the building of this square. The Residenzbrunnen horse fountain is actually a richly decorated baroque fountain, also known as the Residence Fountain. This fountain is widely accepted as the most beautiful fountain in the city, and also the biggest Baroque fountain of its kind outside of Italy. If you look carefully, you can make out some bizarre motifs within this fountain. 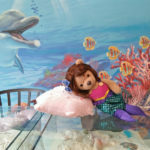 There are four snorting horses, rock giants, three dolphins, scallops, a Triton and a conch-shell trumpet. These ornate carvings are attributed to the work of Tommaso di Garone, an Italian sculptor. The Hohensalzburg Castle sits commandingly on top of a hillside in Salzburg city. This impressive fortress is a prominent backdrop overlooking the old town’s marketplace. The castle was built close to 1,000 years ago, and was initially meant for residence and protection of the archbishops. There were prison chambers built in the castle to punish those who oppose the rulers. You can take the funicular from the marketplace to the castle. Alternatively, you could opt for a strenuous uphill hike that will take you to the top in about 15 to 20 minutes. Once you’re there, visitors are free to explore the castle and roam their mysterious medieval rooms, spacious courtyard and reinforced bastions. Highlights in this castle include the Golden Hall with its gold-studded ceiling, the museum of Marionette and Fortress, as well as a showcase of medieval torture devices that will send chills down your spine. If medieval torture devices are not your cup of tea, the breathtaking view from the top makes this a very worthwhile trip. 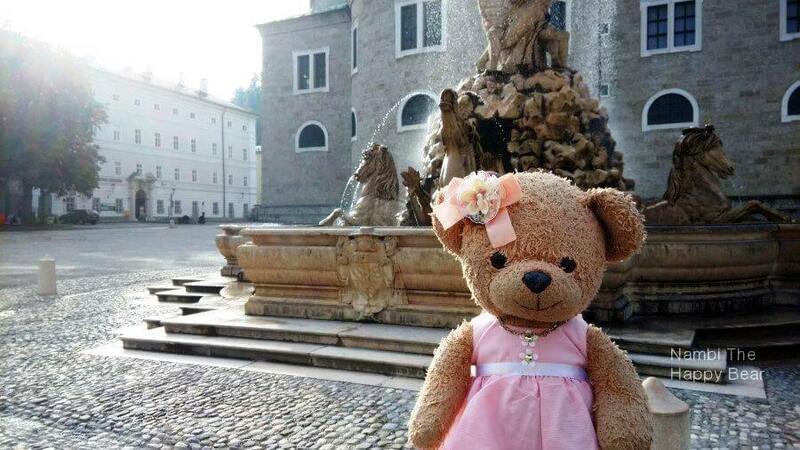 The Kapitelplatz is a square located right at the foot of the Hohensalzburg Castle, in the Old Town (Altstadt) of Salzburg. The square is flanked by the Salzburger Dom cathedral and the Kapitelscwemme, a famous Baroque horse well. Having said that, spotting the gigantic golden sphere is the easiest way to tell that you are right in the middle of Chapter Square. This golden sphere is actually an art installation by Stephan Balkenhol called the “Sphaera”. “Sphaera” stands at more than 9 metres tall, depicting a male figure on top, carrying a neutral expression. His artwork were meant to invoke great range of interpretation, reflecting everyday reality yet stay emotionless and anonymous. On the other side of the square, the horse well, also known as the Chapter Fountain, has an interesting story to tell. During the middle ages, a horse pond was already situated in the middle of Chapter Square. Under Archbishop Leopold Firmian’s rule, the new fountain was built in 1732 by Franz Anton Danreiter. Taking inspiration from Roman fountains, the ramp used by the horses to drink goes straight up to the sculptures. 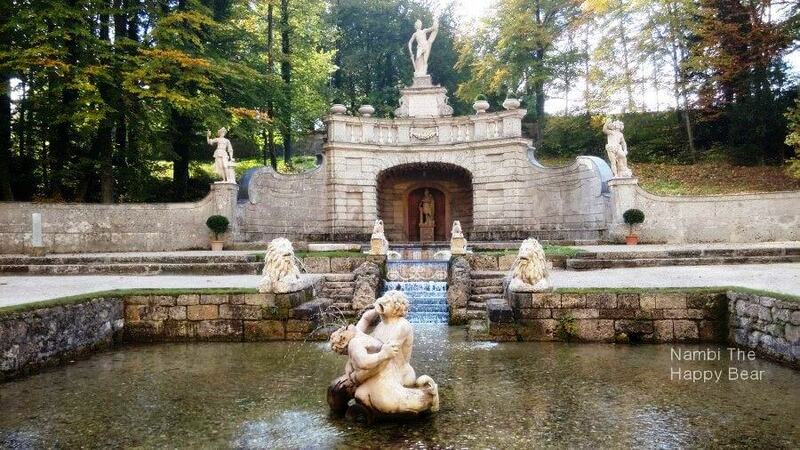 Neptune, the God of Sea, is most prominent in this fountain. Visitors can see him holding a trident and crown while mounted on a seahorse. The figures was sculpted by Josef Anton Pfaffinger. This was a lively square with people playing chess with giant chess pieces. There were plenty of stalls selling food and tourist souvenirs. 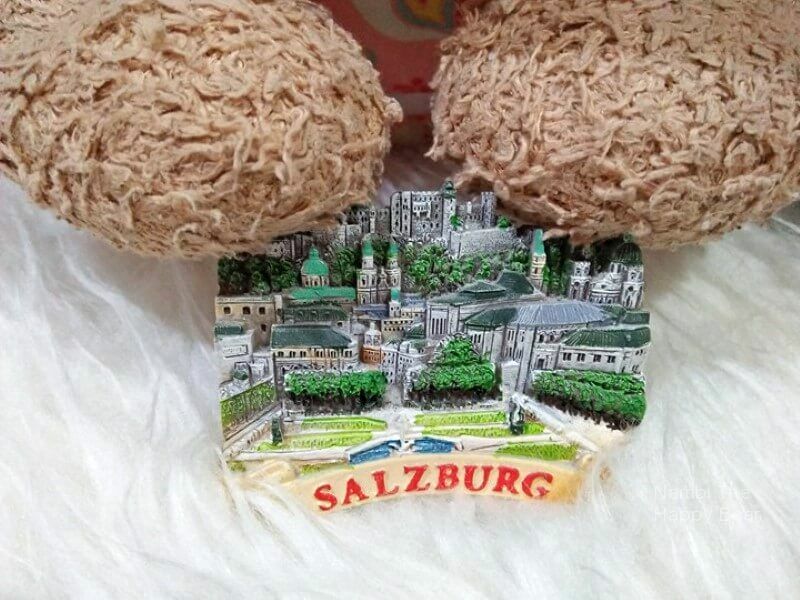 We bought some of our Salzburg magnets over there. This place was amazing! 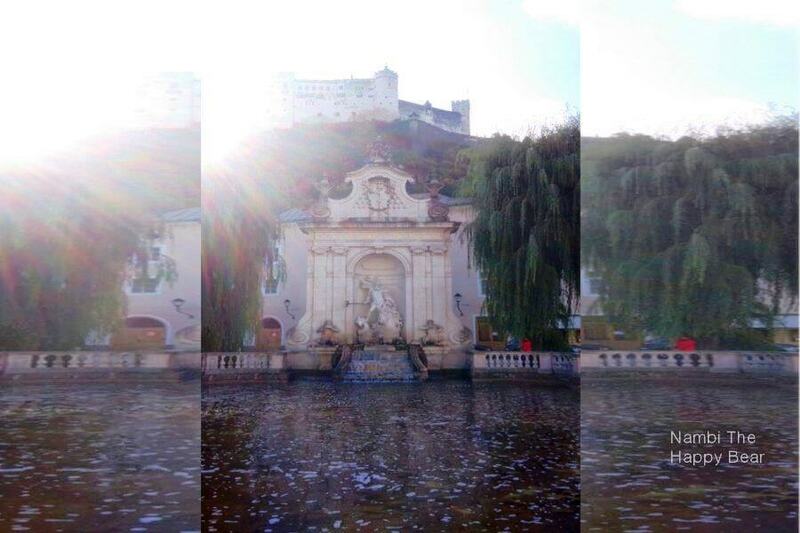 I can say it’s like a highlight of my Salzburg trip. 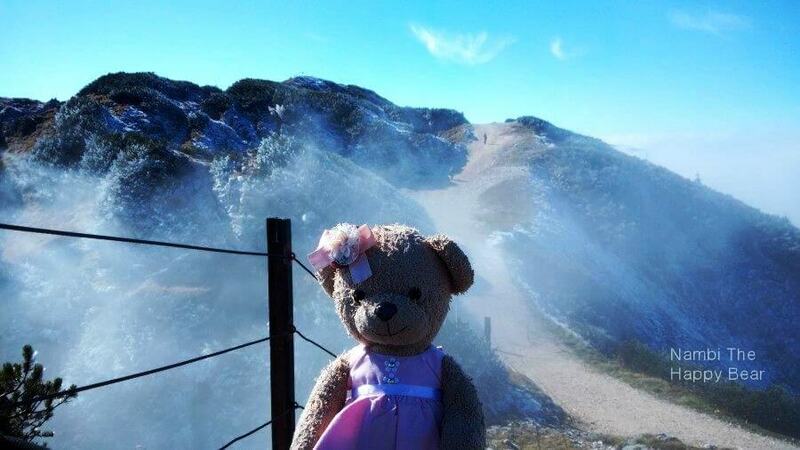 It was snowing up there, oh my gosh…I was super excited to suddenly see snow up there as it was so sunny in the city (tho the weather was very cold still). Then also saw tundra lands for the first time! My mama used to read a book about tundra for me (sounds very intellectual isn’t it? ahaha). The tundra biome we saw on top of untersberg are among the coldest and harshest place on Earth. Tree can’t grow here because the climate is simply too cold and windy and you hardly get any rainfall at all. 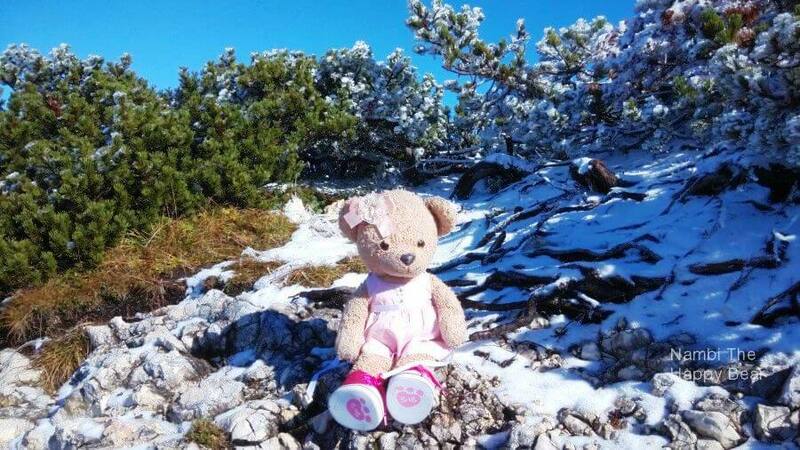 Everywhere on the top of Untersberg was snow-covered for much of the year. I guess we will have to wait until summer months before we will be able to see some wildflowers. 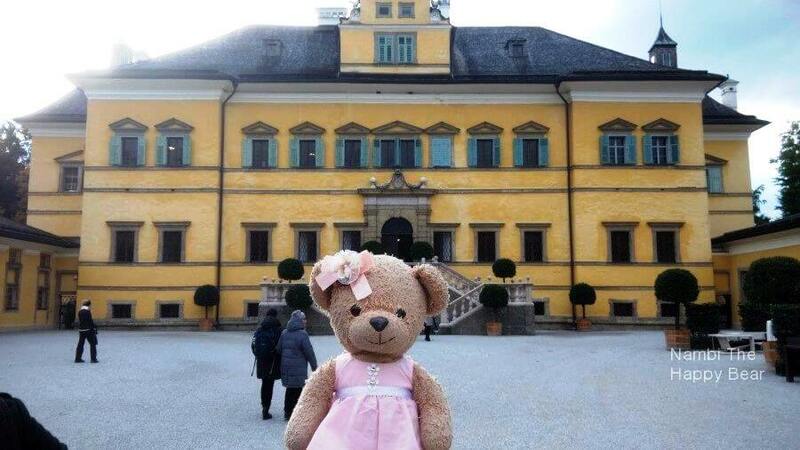 Schloss Hellbrunn was built by the Archbishops of Salzburg to serve as a summer palace. Today, the palace is still standing grand as ever. 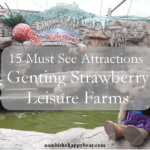 Visitors can take a tour around the palace and gardens, but you should not miss out the famous trick fountains that requires an entry ticket for admission. Beware as the playful tour guide springs jets of water on unsuspecting tourists! Do not be fooled into thinking that carrying an umbrella or wearing a raincoat is going to keep you dry! Everyone had a lot of fun and enjoyed the camaraderie of the tour! Remember to smile as you get ambushed by the water fountains coming out of nowhere, as professional cameraman will be there to capture the fun moments. You can buy the photos later, near the exit. 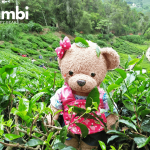 Afterwards, feel free to explore the children’s playground, wading pool, and mini zoo located in the compounds. 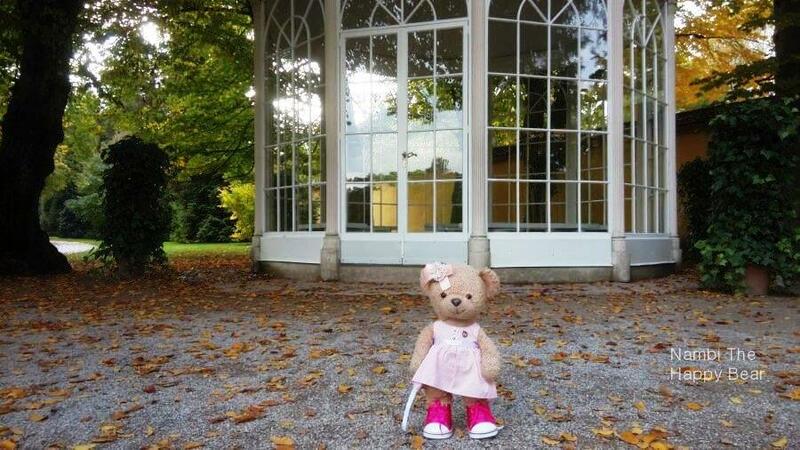 While you were here, do not forget to take a photo at the gazebo used in the shooting of The Sound Of Music. 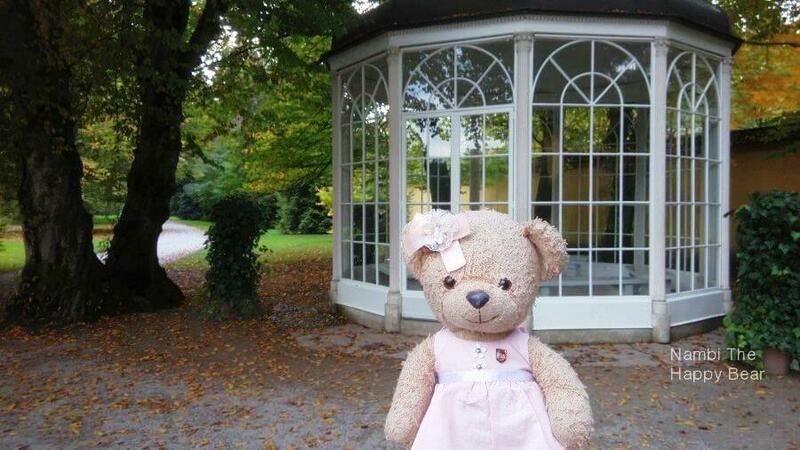 The doors into the gazebo were locked. Supposedly because way too many people have broken their legs dancing and hopping from bench to bench inside the gazebo, emulating the scenes of Sixteen Going On Seventeen. Hilarious! I danced to “I’m Sixteen Going On Seventeen” right in front of the gazebo. So excited that, even my ribbon fell out! That’s nearly all we can remember from the trip. Worth special mention was the lady caretaker at Pension Jahn, our lovely host during our 3 days 2 nights stay in Salzburg. 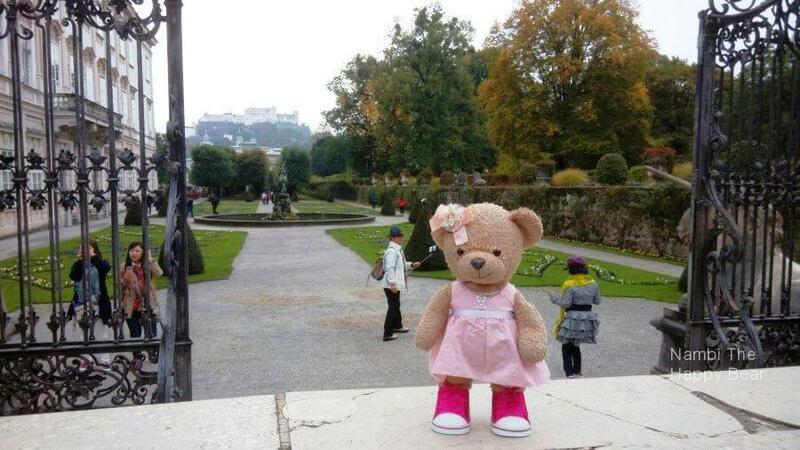 She can speak mandarin and she has been very helpful in showing us how to get to the Salzburg tourist attractions. Her service was exemplary, the rooms were cosy and the breakfast was simple and nice. 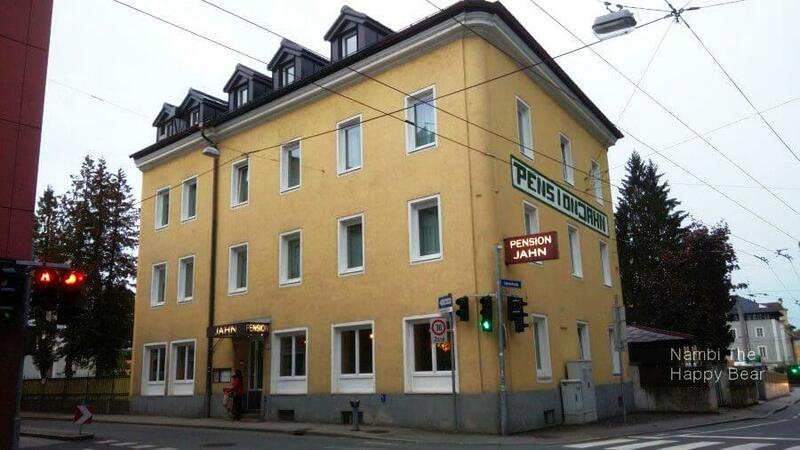 We will highly recommend that you stay with Pension Jahn when you come to Salzburg. 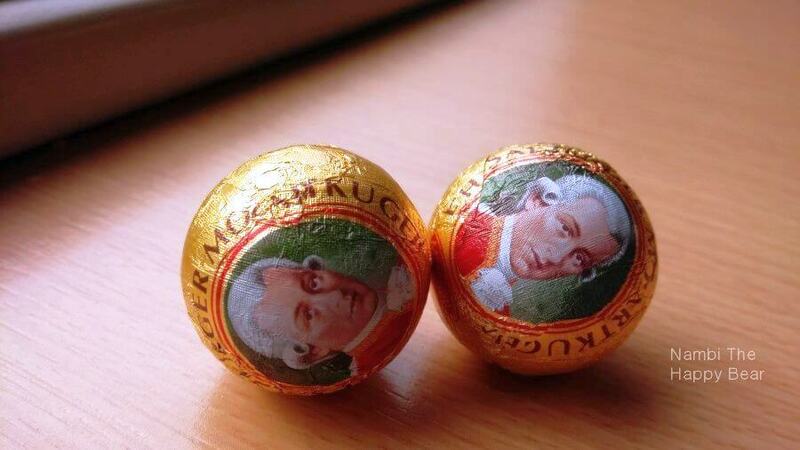 She even gave us some complimentary Mozart Kugels during check out. The allure of Salzburg will continue to captivate visitors from all over the world with its stunning scenery, historical heritage and two world-famous music and cultural icons. For your next Europe vacation, we highly recommend that you come to Salzburg and experience for yourself the magic of this musical city. See you guys soon in our next adventure!